After restarting their season with competitive friendlies Leicester City Ladies Development sides first trip was to Sheffield Senior side Edlington Royals under the lights at Yorkshire Miners FC. With several trialists and debutants City put a fine display with a result that doesn’t reflect the match. The home team started the brighter and took the lead inside 15 minutes when the striker pounced on a rebounded shot. It was soon 2-0 from a long range strike and City looked nervous which is understandable after a tough start to their year. The away side then got themselves together however and didn’t want half time to come as they were on top . Second half Leicester City Ladies were more dominant in the final third, Edlington Royals had two chances on the break first a header which went over the cross bar and the second was stopped when Rowlands pulled off a double save. City were now in their stride however and it was a proper football match, Hill and causing problems down the right and Kim and Thia up top worrying them with pace . Soon then Keeleigh Hutchings joined the attack to make it a pacey front three with trialist Emma Fisher who had a fine game just in behind and all of a sudden the away side looked more likely of scoring a goal. Soon it came when Keeleigh Hutchings slammed home a fine penalty she and Wright when on to have two chances which the Edlington goalkeeper pulled off some fine stops. With bodies going forward trying to get some reward for their nights work Edlington caught City on the break and from the resulting corner sealed the game with a 3-1. Overall a good start on the development teams new journey in 2014/15 as the team worked incredible hard and made what was all in all a friendly game very enjoyable and good footballing match from both teams. Leicester City Ladies took on a new look Curzon Ashton side on the search of points at Leicester Road Stadium. City started the brighter and a fine team counter attacking move between Stacey Hills and Becky Preston took the home side up the pitch and the ball played in was perfect for Kay Hillier to finish superbly into the corner. Second half a galvanised away side hit back with a wonder strike from the right wing to level scores. Leicester City Ladies responded quickly and regained the lead with another fine goal from a excellent Hillier cross Becky Preston headed home superbly into the bottom corner. Credit to away side as a new look Curzon Ashton pushed hard, Leicester City Ladies could of sealed it more convincingly but a 2-1 win was enough. 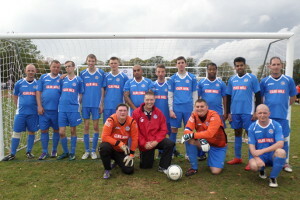 Leicester City Ladies manager Matt Cook commented after the match “Overall four wins out of five for City in what is a touch time for the club. Credit goes to the team for the month October and huge credit to the young players who shone for City today, special mention goes to Laura Foster and Stacey Hills on their first full senior debuts. Leicester City Ladies U15’s maintained their 100% record in a 7-1 win at home to Haunchwood Girls in a scrappy encounter. Leicester City Ladies never got going in the 1st half and were only leading 2-0 through good strikes from Tamzin and Olivia C. With four players missing through injury and holidays the side just could not get into their stride. They huffed and puffed but some still seemed to be on half term! The 2nd half started in the same vain and Leicester City Ladies were rocked when Haunchwood pulled a goal back to make it 2-1. Haunchwood were battling hard and seemed to want it more than our girls. However at last the girls decided to wake up and produced a good last 25 minutes where they created chances at will and scored 5 times through Lauren, Jenna x 2 and Olivia C x 2, to complete her hat trick. This game should be a wake up call for the girls to realise you only get a good performance and results if 100% is put in by the whole team. Leicester City Ladies: Jocelyn, Eleni, Beth, Shania, Laura, Lauren x 1 , Chloe , Megan, Olivia C x 3, Jenna x 2, Tamzin x 1 and D’shayney. 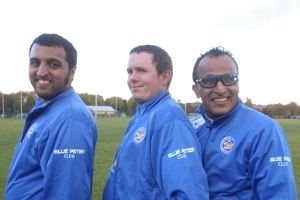 Leicester City Woodgate, Leicester City ladies FC’s Inclusive Section, was host to the October Fixture programme of the Leicestershire & Rutland Inclusive Football League. 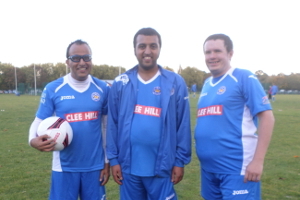 AFC Andrews supported the event which was played at their great new facility. 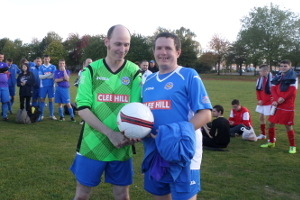 Benny Irwin, AFC Andrew’s Chairman was a massive support on the day, as were Kerry and Kay who run the 3G Sports Bar – so a massive Thank-you for making All of our Inclusive Teams and Clubs very welcome. 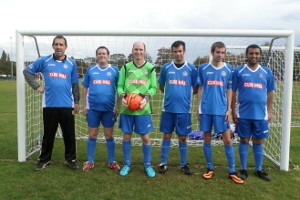 With the Leagues’ ethos of Fun, Fair Play and Respect whilst playing competitive football a good day was had by all teams taking part from nine Inclusive Clubs around the City and County. 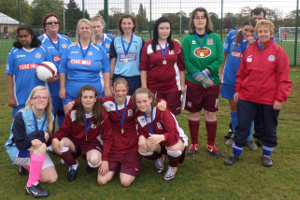 The day kicked off at 11.00am, with Ladies from Leicester City Ladies/Woodgate and Asfordby Amateurs Ladies and Girls Inclusive taking on Northampton Town Ability Counts team. 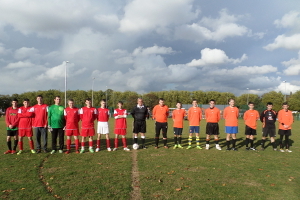 The match was very competitive with some excellent football and team work from both sides. 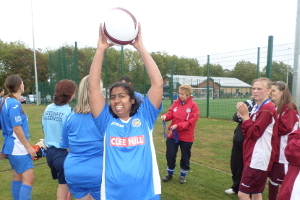 All the Ladies taking part were awarded a medal for their efforts with Prya Patel, Leicester City Ladies/Woodgate, winning the Player of the Day Award for her brilliant goal and all round effort. The Adults, Youth and Junior Sections kicked off at 2.00pm, again with Player of the Day awards being presented at the end of the days football. A massive Thank-you to All our volunteer referees and team managers on the day, without whom we would not be able to run the event, Club Chairman, Steve Crayfourd, Nathan, Issy and Emily Worrall, Becca, Jordan, Paul, Annie & Helen Rudkin, Kai Billington, Patsy, Mick Pinney, Paul Rudkin, Manjit Takhar, Dave Codd and Jo and Archie. 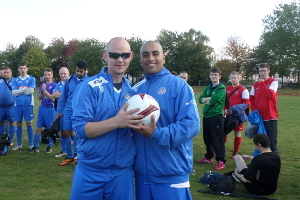 A great day was had by all involved and the weather was very kind to us at AFC Andrews great facility. Leicester City Ladies Diamonds U15’s maintained their 100% record in a 2-1 win away to Loughborough Foxes in a tough encounter. Leicester City Ladies dominated the 1st half and were only leading 1-0 through a Jenna strike half way through the half, playing their best half of football this season. They dominated the play and had numerous chances but found the Loughborough keeper in inspired form and a 1-0 score line did not reflect the outstanding half of football the Diamonds had produced. However the 2nd half was a completely different affair. Loughborough Foxes, realising they were still in the game matched Leicester City Ladies all the way and the game became a battle. Both sides were playing well and it was a good game to watch. Loughborough equalised with five minutes to go and it looked if the game was heading for a draw. However the Leicester girls showed their spirit and got a winner in the last minute with a lob over the keeper from Olivia C.
Overall it was a deserved win on the balance of play through the whole game but credit must also go to Loughborough Foxes who were superb in the 2nd half. Leicester City Ladies: Jocelyn, Shania, Lucy, Beth, Tamzin, Olivia C x 1, Lauren , D’shayney , Tiarna, , Jenna x 1, Olivia D , Molly and Chloe. 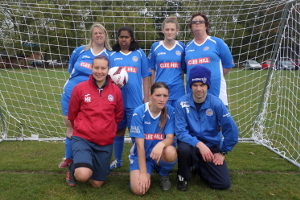 Leicester City Ladies Diamonds U15’s beat Cosby Cats 7-0 with a workmanlike win. Leicester played some good football in patches but never really got into their stride like last week. This was probably down to a lot of chopping and changing by the joint managers trying players out in different positions which disrupted the flow. That said Leicester City Ladies were always in command against a spirited Cosby side. Leicester City Ladies opened the scoring through D’shayney who drilled in a shot after some determined battling. Lauren then scored twice with two powerful headers from corners. D’shayney added a fourth before half time. Half Time – Leicester Ladies Diamonds 4 Cosby Cats 0. Leicester City Ladies started off the 2nd half in determined mood with their passing a lot better. They added a fifth with a close range shot from Olivia. To their credit Cosby never gave up and still tried to attack as much as possible. Leicester made it 6-0 with a good finish from Chloe and D’shayney was able to complete her hat-trick just before the finish with a neat finish. Overall a good result played and watched in the right spirit by both sets of players and parents. Leicester City Ladies Diamonds:- Jocelyn, Laura, Lucy, Tamzin, Olivia C, Lauren x 2, D’shayney x 3, Megan, Chloe x 1, Jenna, Olivia D x 1, Molly, Eleni, Shania and Beth.